When traders think about the stock market, they generally view it as the S&P 500 or the DAX or Nikkei. But stock markets are much more than indices, stocks markets are a market of stocks. Individual stocks make up the market and there is always a bull or bear market somewhere, it just up to a trader to find them. Trying to sift through stocks to find the ones that are really moving is easier than you think. Here are a few quick tips on how to find the stocks that will help you make money. One of the first things you should consider doing is finding which sectors are actually moving. There are many tools that can help you evaluate this process, such as a market carpet. Stock Charts market carpet is a great tool as it tells you which sectors are performing or underperforming over a specific period of time. You can evaluate time periods as short as 2-days or a long as 60-days. Many financial platforms have a sector performance scenario analysis, and this can help you determine what is moving and why the is either rallying or dropping. By using some form of sector performance gauge, you can determine where there is a bull or bear market and use that to jump on a trend. The market carpet uses red for underperformance and green for outperformance and white for neutral. 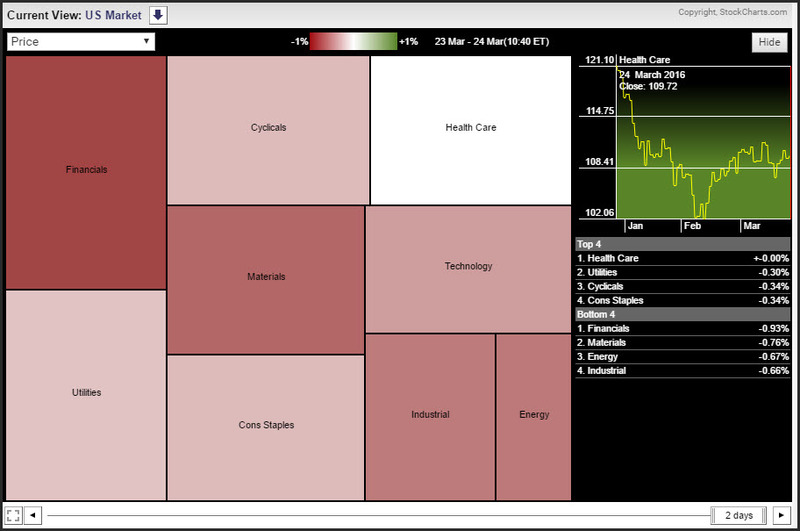 There are different shades of these colors that tell you how much specific sectors are either out performing or under performing. Additionally, this tool will show you the individual stocks that are associated with the sector and how well these stocks are performing. Once you have found the stocks that are moving you can draw a chart of these stocks to determine if it fits your technical criteria for either buying or selling the stock. In general, the sectors are broken down into growth or defensive stocks. Sectors in the S&P 500 index that are considered growth are technology, healthcare, cyclical (discretionary), financial, energy, materials and industrials. The sectors that are considered defensive are utilities and staples. Staples are items that people use every day and therefore the products that these company’s sell will remain constant despite the economic backdrop. For example, you will still buy paper towel for you home regardless of the market conditions. People generally use electricity or natural gas in the same volume regardless of the market conditions. Growth stocks are generally those items that benefit from a strong economic backdrop. When an economy is performing well, people buy more discretionary goods, companies will build more plant and the demand for energy increases. So to help you determine which way the market is moving you can break down the market into sectors and then determine which stocks are driving the market direction. You then can combine this knowledge with your view of the macro backdrop to determine if the drivers of the market are fundamental sound. This is a great way to help you determine what is driving the broader stock market, and is key to finding the stocks that are actually on the move.